ScreenTips in Access 2019 are the little names and brief descriptions of onscreen tools that appear when you put your mouse pointer over buttons, commands, menus, and many of the other pieces of the Access workspace. Not all onscreen features have ScreenTips, but for anything you can click to make something happen — as when a dialog box opens, Access performs some task for you, or something is created — these typically have associated ScreenTips that you can choose to view or not view. If you choose to view them, you can choose to see very brief or more elaborate tips. 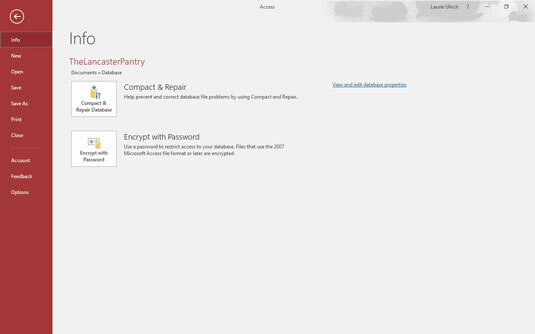 The File menu (the red panel on the far left) and the Info view appear on the workspace, as shown. The File tab’s panel of commands gives you an Options command, which you can use to adjust how Access looks and works. 2. Click the Options command, near the bottom of the menu. The Access Options dialog box appears onscreen. 3. 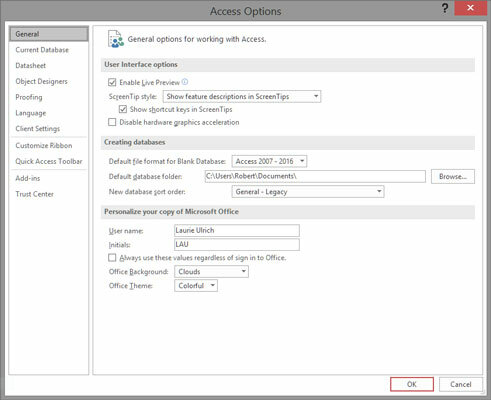 From the list on the left side of the Access Options dialog box, select General. The options in the dialog box change to show other options related to ScreenTips, file formats and folders, and how your name and initials are stored, as shown. The settings for just about everything you can see and use in Access are available through the Access Options dialog box. 4. In the first section of the dialog box, click the ScreenTip Style drop-down list. Show Feature Descriptions in ScreenTips: This option displays ScreenTips with extra information, as shown here. Here you see that in addition to the name of the button, a brief description of how it works (or its effect) is displayed for your benefit. It even points to more assistance and information — through the “Tell me more” link at the bottom of the ScreenTip. View the helpful button and tab names and information. Don’t Show Feature Descriptions in ScreenTips: If you want just the facts, ma’am, this is for you. ScreenTips will show just the button name with no further explanation. Don’t Show ScreenTips: Want to go it alone? Turn off ScreenTips. 6. Click OK to close the Access Options dialog box. Establishing the level of detail included in ScreenTips isn’t the end of your options. You can also choose whether to include keyboard shortcuts in ScreenTips. This is on by default, and it’s pretty useful.